Most people underestimate the amount of work it takes to set up and configure a new WMS. The data cleaning and data populating alone is a large task. If you don’t understand how the system really works until it’s up and running, you may fail to implement or configure the system in exactly the right way. What to learn more? 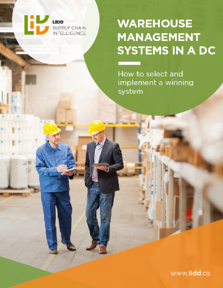 LIDD’s eBook Warehouse Management Systems in a DC: How to select and implement a winning system shares insights into how to find prospective WMS vendors, what to ask for in a WMS demonstration and what makes for a good selection and implementation process. Download the eBook to get more insights into picking the right WMS for you.